Oh boy, what a busy weather forecast over the next week! Let's talk about heat and humidity, thunderstorms, a big cooldown, persistent rain and clouds, heavier rain, and a hurricane. Yuck. As the vast majority of NJ school districts go "back to school" this week, it's no surprise that we have hot weather in the forecast. It is still summer, after all! However, Thursday's heat looks particularly oppressive. Sweltering. Disgusting. Potentially dangerous. I know it's a contentious topic, but I vote that 90+ degree classrooms are not conducive to learning at all, and any early dismissals are justified. In what could be the most uncomfortably hot and humid day of the week, Thursday morning temperatures are already in the upper 70s for much of the state. Except for the immediate coast, we'll see lower to mid 90s by Thursday afternoon. The heat index ("feels like" or "apparent" temperature) will probably exceed 100 degrees for several consecutive hours. A Heat Advisory remains in effect until 7 p.m. Thursday for the following 17 NJ counties (some partials): Bergen, Burlington, Camden, Essex, Gloucester, Hudson, Hunterdon, Mercer, Middlesex, inland Monmouth, Morris, inland Ocean, Passaic, Somerset, Sussex, Union, and Warren. You'll catch a hint of relief along the Jersey Shore, with temperatures "only" in the 80s. However, the surf will be rough in spots, with a moderate risk of rip currents posted for Thursday. Most of Thursday looks bright and sunny. Starting around 3 p.m., we'll be watching the sky for a popup shower or thunderstorm. Lots of energy in the atmosphere, given the heat and humidity, so any storms may form and intensify quickly. The greater chance of widespread rain will arrive Thursday evening, arriving around 6 p.m.. As a strong cold front approaches New Jersey, a line of scattered showers and thunderstorms will press into the northwest corner of the state. Again, there's a good chance those storm cells will be on the strong side, with very heavy rain and some vivid lightning lighting up the sky. 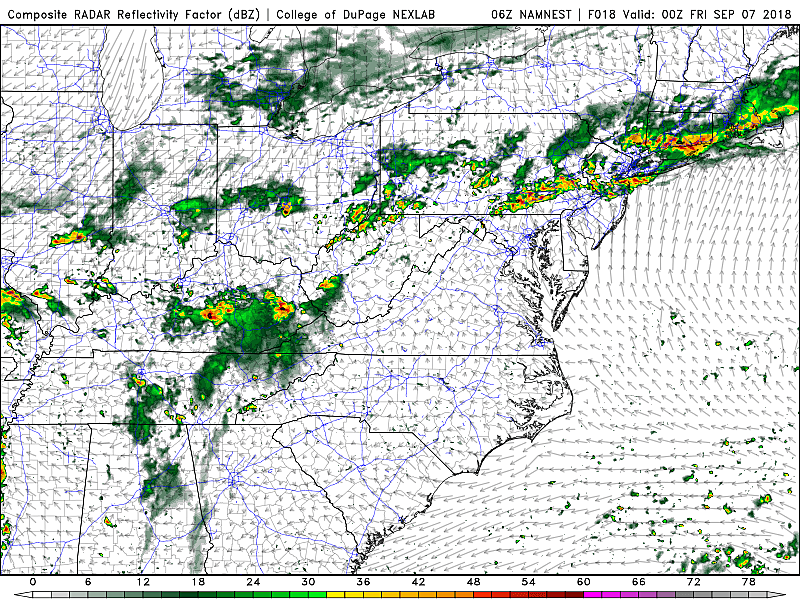 By about Midnight, the storms should fizzle out considerably. That may happen well before the squall line reaches New Jersey's south coast. Therefore, it's totally possible that South Jersey misses out on these overnight storms. Behind the storms will come the cold front. And behind the cold front will come much cooler air. You won't necessarily feel it Thursday night, with models suggesting low temperatures will only dip into the lower 70s. But Friday? What a difference! Thermometers will only reach the mid to upper 70s — that's actually a bit below normal for early September. However, as we've discussed, the cooler air comes at a coast. With a stalled front just south of New Jersey, and a steady on-shore (easterly) flow, our weather looks pretty bleak for Friday. And beyond. Persistent showers are expected throughout the day Friday, especially around South Jersey. North Jersey will have a drier and slightly more pleasant day — you might even catch a peek of sunshine, but don't bet on it. And the soggy weather will just keep coming. There's a bit of uncertainty in the forecast here, so I don't want to pinpoint too far just yet. At the very least, the weekend will be cloudy and cool, with high temperatures only in the upper 60s to lower 70s. In addition, periods of light to moderate rain are in the forecast for both Saturday and Sunday. However, neither Friday, Saturday, nor Sunday appear to be a total washout. There's a reasonable chance that areas of the state catch a break of dry weather at some point over the weekend — especially to the north, and especially late Saturday to early Sunday. Monday's weather forecast will be largely driven by the remnants of Tropical Storm Gordon. As of this writing, Gordon is classified as a Tropical Depression, centered over eastern Arkansas and still charging inland to the west-northwest. That tropical moisture will soon "hang a U-turn", get caught up in the west-to-east jet stream, and head toward the Northeast U.S. by early next week. The GFS and Euro models still have differing opinions on where the bulk of that "blob" of moisture will go. GFS has it passing through northern New York on Monday, close enough to deliver "run-of-the-mill" rain here in the Garden State. 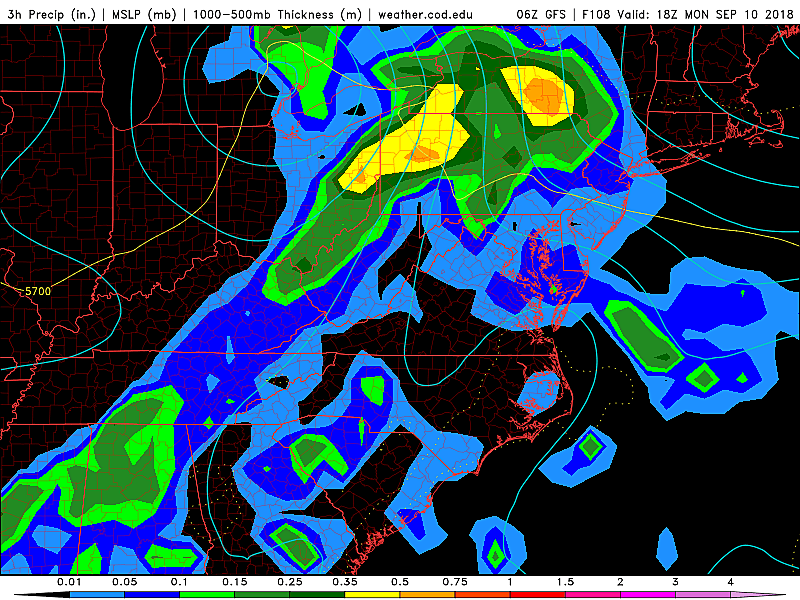 The Euro solution is a bit earlier and further south, suggesting heavy rain from late Sunday to midday Monday. You know my rule. Never underestimate the rainfall potential of tropical moisture. Even if the bulk of those remnants pass north of New Jersey, we'll have to remain wary of the flooding potential. In general, our forecast just looks dreary and occasionally damp until Tuesday. By now, you've probably seen some information (and/or potential misinformation) regarding Major Hurricane Florence. I posted my thoughts on Facebook last night. 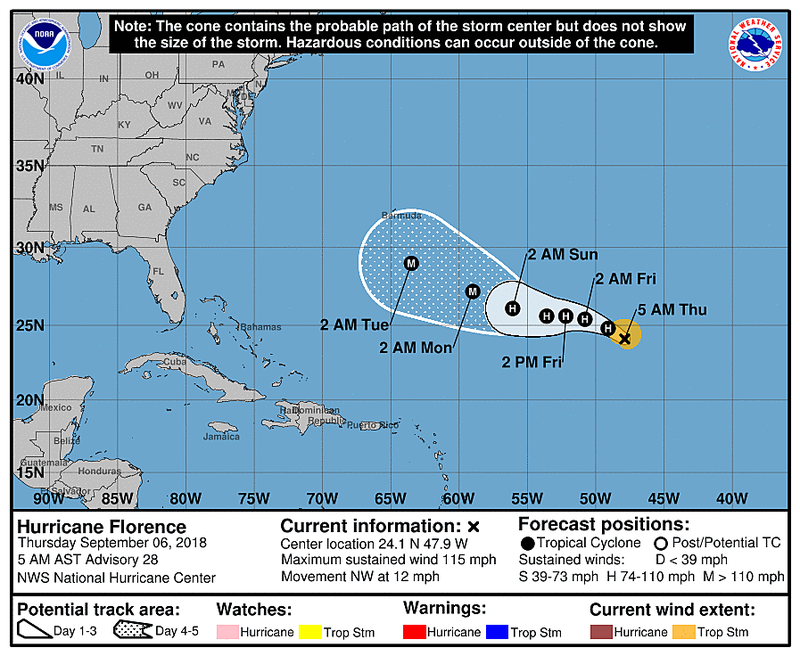 I'm going to do a separate weather blog write-up on Florence later this morning, both to quell some hype and also to analyze the risk the storm could pose for late next week. Stay tuned!